Two Gun Quiche House first started out serving quiches from their food booth at Saskatoon Farmers' Market. They were so successful they decided to open up their own restaurant in Riversdale, one of the oldest neighborhoods in Saskatoon. Two Gun Quiche House opened in 2012 and can be located at 135 20th St, Saskatoon Sk. It is a cozy establishment with approx. 15 tables and street front parking. The lower half of the walls are painted purple with the top a bright cheery yellow color. Wanted signs/vintage signs hang on the walls which I am guessing compliment the name, Two Guns Cohen that the restaurant was named after. My only critique was the floor near the front of the restaurant needed sweeping as there were crumbs and used coffee creamers lying around and the place hadn't been open too long that day. Finding information about Two Guns Quiche House is a bit tough as they don't have a conventional website. They do utilize Facebook extensively but nothing else. Chef Bill Mathews seems to use Facebook as his only means of communication as he did post that he is postponing being open during supper due to a lack of clientele. Maybe a website or more social marketing is in order? 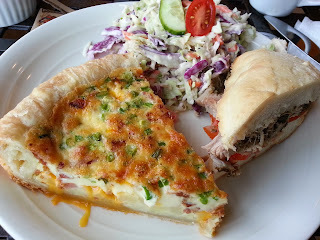 My husband and I had gone to Two Guns Quiche House for breakfast one morning and it had a steady stream of clients. It wasn't busy by any means so the one waitress on staff was able to keep up with demand and was attentive to our needs. She was pleasant to interact with and I thought she did a good job. sandwiches along with a few salads and soups. Each meal is paired with soup or coleslaw. Everything is made in-house using local fresh ingredients. This seems to be the norm with new restaurants popping up all over the place in Saskatoon. As they are known for their quiches, I had to try one. I had their Breakfast Quiche consisting of fluffy egg mixes with bacon, potato and cheddar cheese. I can't recall having a quiche before so I can't compare it to anything else but it was delicious. My husband tried the Porchetta Sandwich, a boneless pork shoulder that is rolled in fresh herbs and slow roasted for 10 hours before being piled high on a focaccia bread. I had a taste of it and it was tasty. My only complaint would be to serve this on a softer bun as it was a bit hard to chew and distracted me away from the flavor of the meat. Pricing here is quite reasonable. Quiche and soup combo is around $11 while the sandwiches range from $12-13. They provide you with decent sized portions so I find the prices fair. My experience here was positive. I can't say I am a quiche person but am willing to go back and try their other sandwiches. I think they have a good thing going but just needs to market themselves a bit better instead of trying to rely on word of mouth. For my husband's birthday I wanted to make something special for him, something I normally wouldn't make any other day. 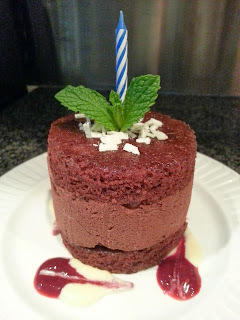 I did some searching and ran across this recipe for Chocolate Mousse Cake which was perfect as I had just acquired a food ring mold and wanted to try it out. Looking at the directions, it can be a bit daunting as there are many pieces to completing the final product but it is worth it! The parts consist of: chocolate cake, chocolate mousse, creme anglais, raspberry sauce, and chocolate ganache. I skipped the chocolate ganache as I felt there was a lot of chocolate involved in this dessert (crazy I know!) but I definitely recommend making the creme anglais and raspberry sauce as it takes this cake over the edge. It also sounds a lot more difficult than it really is. When making the cake, be sure to shake the pan after pouring the batter in or use a spatula to spread it out to ensure your cake pieces are even/level. You can make the cake ahead of time as the recipe states saving you time. I recommend making the mousse the day of as it is easier to manipulate. An easy way to melt the chocolate is to first break up the chocolate into smaller pieces and place it in a metal bowl. Place the bowl over a saucepan with a small amount of water (ensuring the water level doesn't touch the metal bowl). Heat the water and slowly stir the chocolate with a rubber spatula. This is a slow process as you don't want to burn the chocolate. Once it is almost melted, remove the bowl and continue to stir the chocolate until it is smooth and shiny. When making the mousse and the chocolate has melted, allow it to cool to room temperature by letting it sit out. Placing it in the fridge or exposing it to cooler temperatures too quickly will cause the chocolate to harden wrecking all your hard work. Don't be scared to make the creme anglais as it is just a fancy term for heating up whipping cream and adding in an egg yolk, sugar, and vanilla. This is a delicious compliment to the cake.